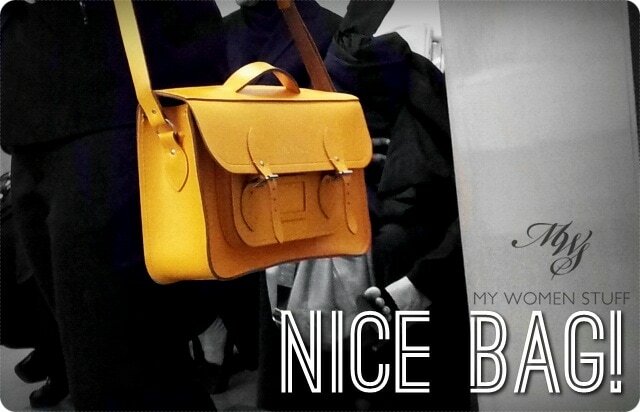 Home » Fashion » Bags » Have you ever complimented a stranger on their bag or accessories? Have you ever complimented a stranger on their bag or accessories? One day, while sitting in queue minding my own business, a flash of bright yellow caught my eye and made me look up from the book I was reading. There, not 2 feet away from me was someone wearing the prettiest, brightest yellow satchel I’d ever seen in a sombre working environment and for some reason, it made me smile. At the same time, I wanted to tell the lady that I liked her bag, it looked absolutely gorgeous and that she had excellent taste. But I didn’t and I sort of regretted it. Have you complimented a stranger on their bag or accessories before? Have you ever complimented a stranger on their bag or accessories? Have you been complimented by a stranger? If I tried grabbing a random stranger, I’d probably earn myself a black eye lol! I compliment people ALL THE TIME. My job deals with a lot of people, so I learned a long time ago to not be too shy about telling people how they look or how pretty their purse is. Just yesterday, at work, I told this woman her hair looked beautiful and that prompted her to tell me that she did it for a dance competition. Later on, I told this girl that I liked her purse. Next time, don’t be shy.